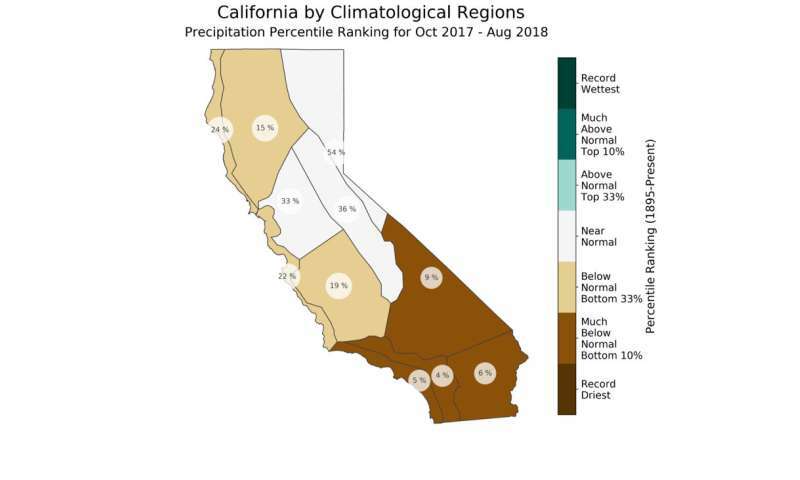 This map, created using California Climate Tracker, shows precipitation percentile rankings for various climatological regions in California during October 2017 -- August 2018. Credit: Dan McEvoy, DRI. Reno, NV (Sept 10, 2018): Scientists from the Western Regional Climate Center (WRCC) at the Desert Research Institute (DRI) in Reno, Nev. are pleased to announce the release of a long-awaited update to a climate mapping tool called the California Climate Tracker. Originally launched in 2009, the California Climate Tracker was designed to support climate monitoring in California and allows users to generate maps and graphs of temperature and precipitation by region. The 2018 upgrade incorporates substantial improvements including a more user-friendly web interface, improved accuracy of information based on PRISM data, and access to climate maps and data that go back more than 120 years, to 1895. "One really significant change between the old and new versions of the California Climate Tracker is that in the previous version, you weren't able to look at archived maps," said Daniel McEvoy, Ph.D., Assistant Research Professor of Climatology at DRI and member of the Climate Tracker project team. "Now you can say for example, 'I want to see what the 1934 drought looked like,' and go back and get the actual maps and data from 1934. You can also look at graphs of the data and see trends in temperature and precipitation over time." In addition to providing historical and modern data for regions across California, this easy-to-use web-based tool can be used to produce publication-quality graphics for reports, articles, presentations or other needs. It can be accessed for free by anyone with a standard web browser and an internet connection. "The California Climate Tracker was initially designed and developed for use by the California Department of Water Resources, but we hope it is also useful to a much broader community of water managers, climatologists, meteorologists and researchers in California," McEvoy said. 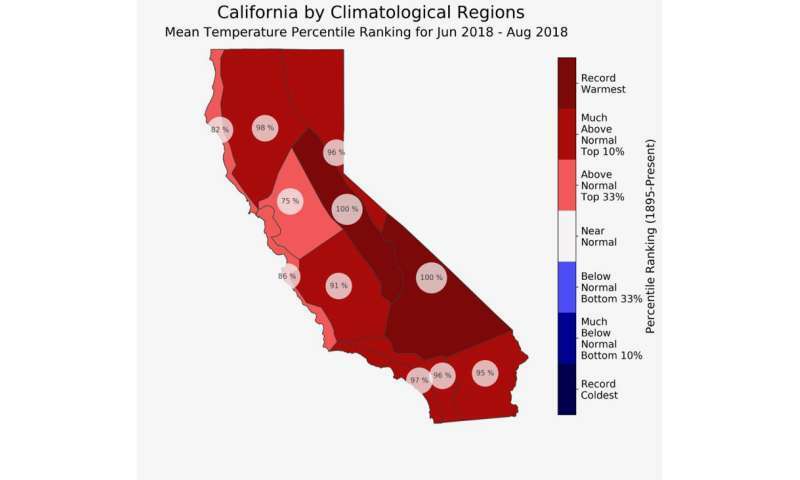 This map, created using California Climate Tracker, shows mean temperature percentile rankings for different climatological regions in California during June -- August 2018. Credit: Dan McEvoy, DRI.